Whitney Houston won six Grammys over the course of her career, and Sunday's Grammy Awards will fittingly honor the memory of the legendary singer, who died Saturday. Oscar-winner Jennifer Hudson and R & B great Chaka Khan are slated to perform a tribute to the late Houston at Sunday night's ceremony, Entertainment Tonight has confirmed. As a 15-year-old, Houston sang back-up on Khan's 1978 hit "I'm Every Woman," a song she herself would record for the soundtrack to "The Bodyguard." 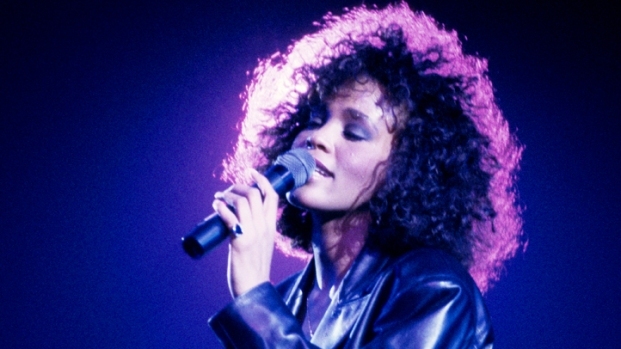 "It's too fresh in everyone's memory to do more at this time, but we would be remiss if we didn't recognize Whitney's remarkable contribution to music fans in general, and in particular her close ties with the Grammy telecast and her Grammy wins and nominations over the years," Grammy executive producer Ken Ehrlich told the Los Angeles Times. Grammy.com was largely devoted to the late singer within hours of Houston's unexpected death, with stars paying tribute to her at a pre-Grammy party hosted by Clive Davis, Houston's long-time mentor. "Her powerful voice graced many memorable and award-winning songs. A light has been dimmed in our music community today, and we extend our deepest condolences to her family, friends, fans and all who have been touched by her beautiful voice," said Neil Portnow, president of the Recording Academy, in a statement,according to E! Online. The Grammy field this year is far different than it was in the late 1980s when Houston's career was at its height, but many artists set to be feted are likely to remember her fondly. Heading into the night with the most nominations is the irrepressible Kanye West, who was seven nods. West is arrogant, boorish, embarrassing, selfish and a lot of other things you don’t want your kids to be, but he's also one of the most vital musical talents of his generation, a man whose reach is only outdone by his vision. He's won 14 Grammys on 37 nominations prior to this year, and come Sunday, he'll be in the running for Best Rap Solo Performance, Song Of the Year, Best Rap/Sung Collaboration, Best Rap Performance, and finds himself going up against himself for Best Rap Song and Album, as "My Beautiful Dark Twisted Fantasy" and "Watch the Throne," his collaboration with Jay-Z, are both nominated. For folks over 40, the highlight of the evening will no doubt be the reunion of Brian Wilson, Mike Love, Al Jardine, Bruce Johnston, and David Marks, aka The Beach Boys, who will play together for the first time in 20 years, sharing the stage with Foster The People and Maroon 5. Others scheduled to take the stage are Kelly Clarkson; Tony Bennett, Carrie Underwood, Chris Brown, Blake Shelton, Coldplay, Rihanna, Foo Fighters, Alicia Keys, Lil Wayne, Bruno Mars, Nicki Minaj, Katy Perry, Bruce Springsteen And The E Street Band, Taylor Swift, Foster The People, Joe Walsh and Sir Paul McCartney. Sunday also promises a resounding comeback from Adele, who in August was absolutely robbed at the MTV Video Awards and then had to cancel her fall tour when her voice went ka-put. Despite her video for "Rolling in the Deep" winning Best Art Direction, Editing and Cinematography, it was not deemed Best Video, losing out to Katy Perry's "Firework." Adele is not only in the running for six awards, including Record, Song and Album, but she's also making her first live performance since having surgery on her throat this winter. And then there's the curious case of Bon Iver, who proves once again how silly the Academy can be. Lead singer-songwriter Justin Vernon released "For Emma, Forever Ago" in 2007 under the name Bon Iver, and after developing a small following, the album was released on Jagjaguwar in 2008, taking the indie rock world by storm. Now, years later, Bon Iver are in the running for Best New Artist, as well as Best Song, Record and Alternative Album. But this is the same august body that named Bob Newhart Best new Artist in 1960, so what're you gonna do? But no single nomination is as mind-bendingly weird as Seth "The Family Guy" MacFarlane's nod for Best Traditional Pop Vocal Album, in honor of his record "Music Is Better Than Words." That's right—the foul-mouthed brain behind Peter Griffin is going up against the likes of Tony Bennett, Susan Boyle, Harry Connick Jr. and Barbara Streisand.